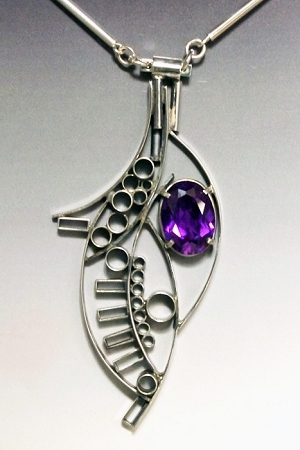 Cubist Jewelry - This is an eye-catching sterling silver geometric pendant that is accented by an oval cut Lab Created purple Alexandrite. This attractive One-of-a-Kind necklace comes with a handmade 24" sterling silver round tube chain. A beautiful high quality (18 mm x 13mm) Oval cut Lab created Alexandrite, which does change colors from pink to purple in different types of light, is set in a 4-prong setting and framed by a collage of sterling silver shapes soldered together. This pendant is oxidized to highlight the different textures. The necklace comes with an adjustable 24'' handmade sterling silver chain. This piece of art is a One of a Kind.